The Easter Holidays are coming and with that recipes for the big celebration pop up everywhere like the spring flowers on the meadows. Instructions how to prepare the perfect lamb roast, the best sauce, the most perfect side dishes, the most astonishing decorations. To me it is a little bit overwhelming. The inner pressure rises with every year – because, don’t we all want to delight our family with simply the best? Last year it was amazing, so it should be even better this time, shouldn’t it? A new superlative with every year? And so we end up spending so much time on thinking about the greater stuff, worrying about the big picture, that we tend to forget the foundation. The things that really, truly make us feel good, loved, and comforted. Cherished. Sometimes it takes merely time to give someone that feeling. After all time is a very precious thing these days. But mostly it also is simplicity what we need, so basic that it can be overseen quickly, and regrettably underestimated. Bread is such a thing. 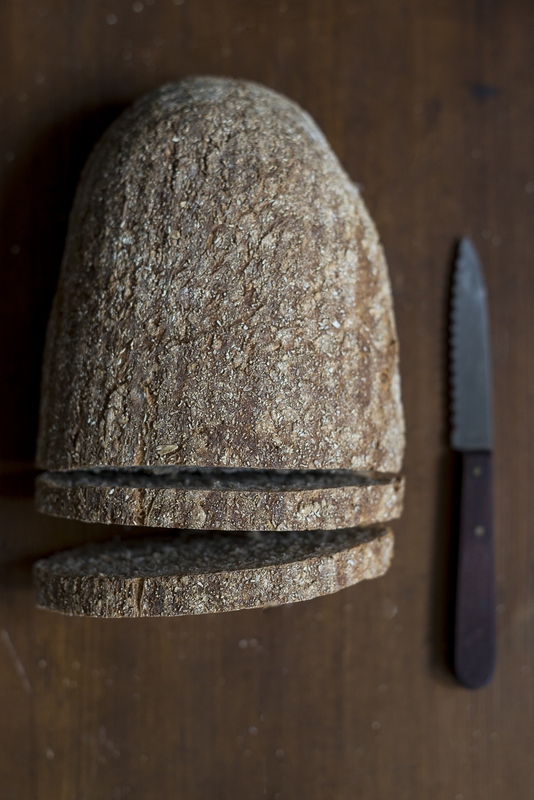 Simple, candid bread, baked with time and devotion can be is a feast. It can make you more proud of what you eat and serve your loved ones than a perfectly orchestrated course menu. It is pristine, pleasant, and perfect in its plainness, chummy even. It brings people together in its quiet, elementary way and pampers us with everything good. Like new favourite of ours. 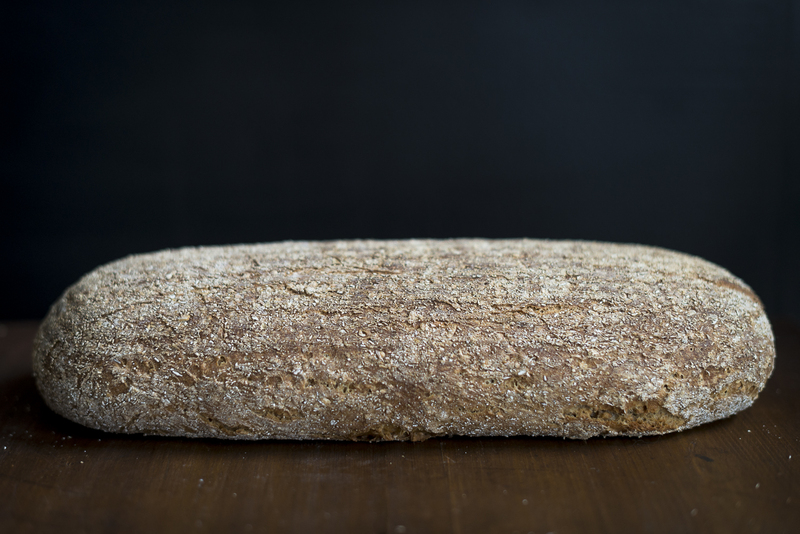 Exclusively baked with sourdough and no additional yeast it is easy to digest and with its whole grain shredded wheat and rye flour it also is saturating and a perfect companion for a hearty meal or spicy cheese. 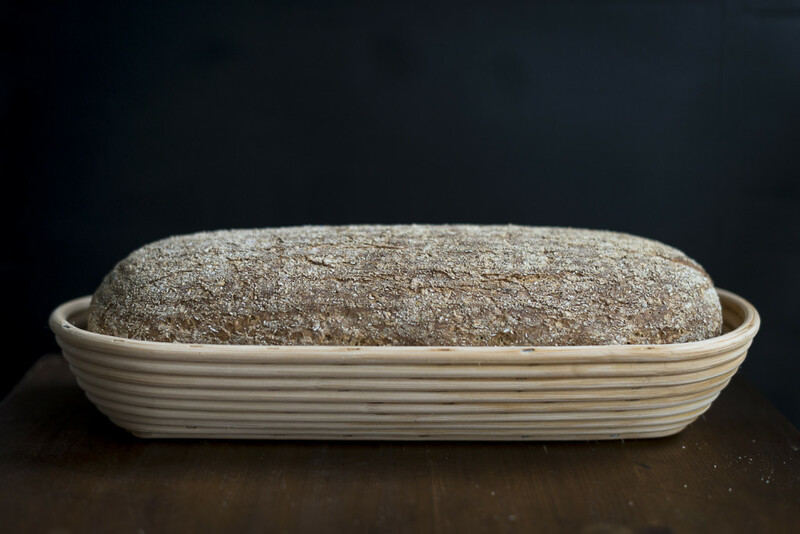 Mix the rye flour with the water and the sourdough starter in a bowl. Cover it and let it rest for 16-20 hours. On the next day mix the shredded wheat with the 200 ml of water and let it soak for 30 minutes. Put together all the ingredients and knead for 10 minutes. Cover the bowl and let the dough rest for 1 hour, while shortly kneading the dough from the rim of the bowl to the middle every fifteen minutes. After that let the dough rest for 1 additional hour. Now fetch a longish baking basket and get the dough out of the bowl to knead shortly but thoroughly. 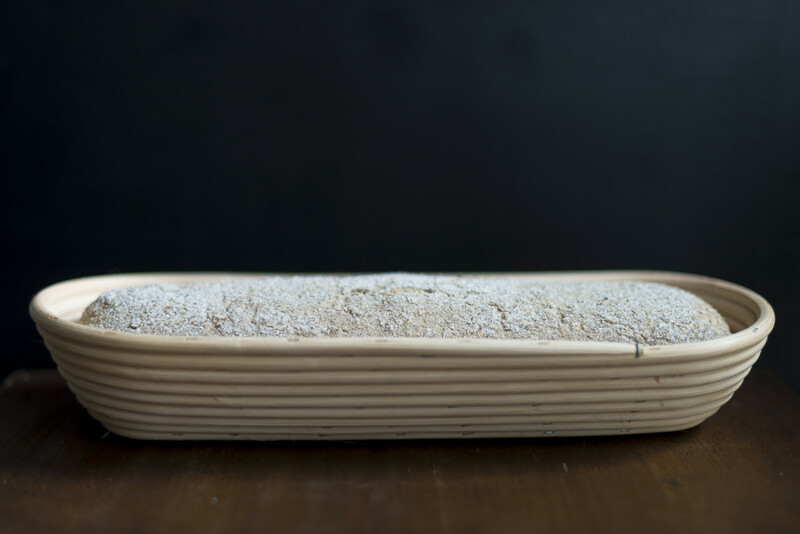 Sprinkle the whole wheat flour on your working surface and roll the dough between your hands and the working surface to form a long loaf that fits into the baking basket and that’s dusted with the whole-grain flour. But the loaf into the baking basket and cover with a clean and dry kitchen towel. Let the dough rest for 3-6 hours, until it has almost doubled its size. Preheat the oven to 250°C and place the loaf onto a heated baking tray with a sheet of baking paper. Put the tray into the oven, switch the temperate down to 220°C. Spray a little bit of water into the oven before closing the door and bake the bread for 30-40 minutes. It should give a hollow sounds when you knock on the bottom of the bread. Let it cool down on a baking tray. 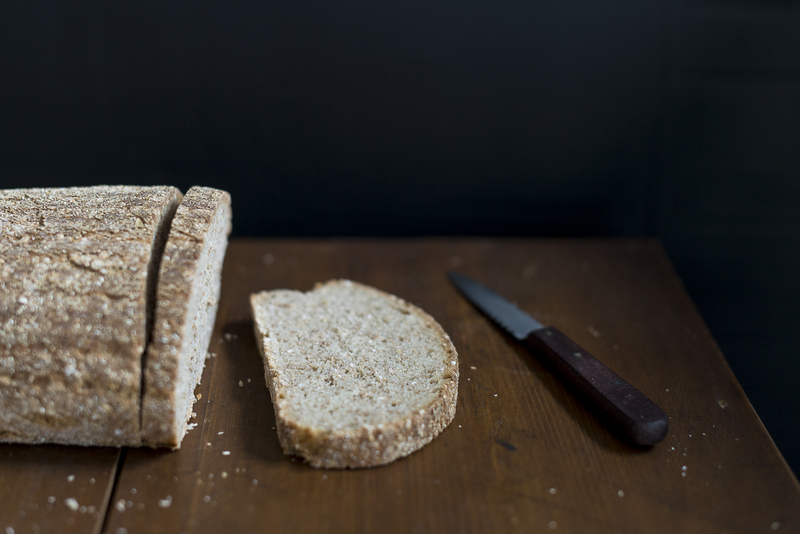 Enjoy with savoury cheese, sausage or simply with good butter. Even better when roasted. Day 6: Congratulations! 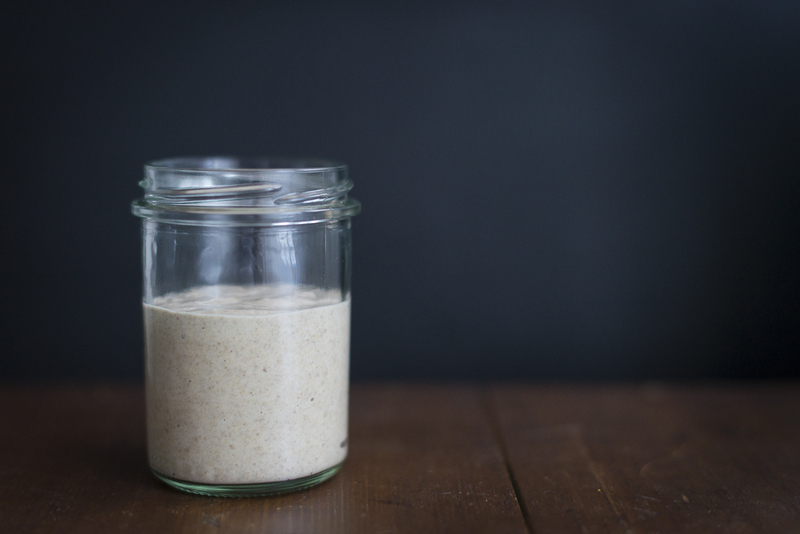 You just made your first sourdough starter! Put it into the fridge and use it for baking. For example as in the recipe above.